116. ROSS. Issued by Stephen Mitchell & Son (1927). 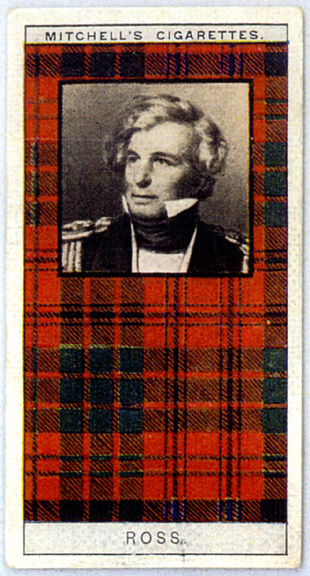 Card number 46 from a set of 50 entitled "Clan Tartans". Size: Ca. 2.67" x 1.4". Recto: Portrait of Ross based on Pearce painting with tartan background. At top: Mitchell's Cigarettes. At bottom: "Ross." Verso: CLAN TARTANS | A Series of 50 | 46 | Ross. | The district of Ross was the home of the Clan Ross who are descended from the ancient Earls of Ross, the first of whom was created Earl by Alexander II for distinguished services in crushing a rebellion in Moray in 1215. Two important branches of the clan were the Rosses of Balnagowan and of Rariches. Read-Admiral Sir James Clark Ross (1800-1862), Arctic and Antarctic explorer, entered the Navy 1812. From 1819-1833 he accompanied expeditions in search of t he N.W. passage and the N. Pole, and in 1831 he discovered the Magnetic Pole. He commanded an expedition of discovery in the Antarctic, 1839-43, and discovered Victoria Land, and in 1848-9 commanded a Franklin Relief Expedition. | Issued by the | STEPHEN MITCHELL & SON | BRANCH OF THE IMPERIAL TOBACCO XO | (OF GREAT BRITAIN & IRELAND), LTD.